Holds up to 50 people, it's enough for a party in you garden. Durable water proof polyethylene cover to keep the secret. Our high quality tents can be conveniently carried and are perfect for many outdoor needs, Ideal for commercial or recreational use - parties, weddings, flea markets, etc. Can be erected on hard surfaces such as decks, driveways, lawn, etc. Size: 30(L) X 10(W) X8.5(H) Ft? █ 【 EASY TO ASSEMBLE 】 The party tent is easy to?assemble. You'd better to have an assistant to help, no additional tools of the canopy tent are required, just keep the frame steady when assemble the wedding tent steel tube and cover. █ 【 MULTIPLE USAGE 】 The party tent is perfect for wedding, party, meeting, camping and so on. 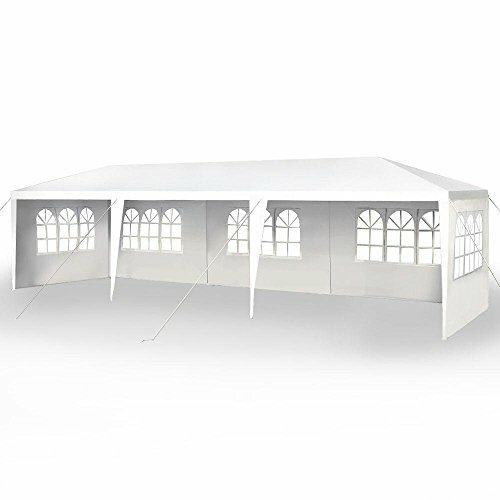 And you can used the wedding tent for backyard barbecue with your friends, or the canopy tent is the best choice for your birthday party as well. █ 【 BIG SIZE 】 The party tent size is 10 x 30 x 8.5ft (LxWxH) ;made with 5 sides walls with window provide the canopy tent more shade. The wedding tent can hold up to an estimated 50 people for dining or party. █ 【ATTENTATION 】 We advise customers to never leave canopy tent up overnight or under bad weather conditions. We will not be responsible for such weather damages. It is up to customers decision to determine the correct weather condition when you choose the party tent. Warning: Polyethylene Fabric of party tent is not fire proof, pls be away from sources of fire. Please assemble the tent with you your friend or who can help. View More In Plant Support Structures. If you have any questions about this product by FDW, contact us by completing and submitting the form below. If you are looking for a specif part number, please include it with your message.